Harvard President Lawrence Bacow has approved Yue M. Lu, the Gordon McKay Professor of Electrical Engineering and of Applied Mathematics, to the role of full professor with tenure at the Harvard John A. Paulson School of Engineering and Applied Sciences (SEAS). 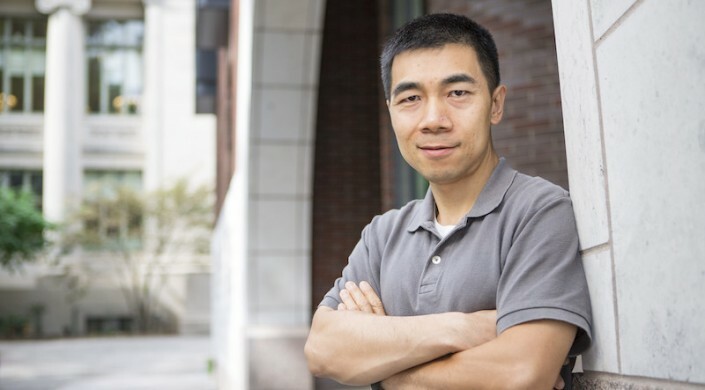 Lu’s research explores theoretical and algorithmic aspects of high-dimensional statistical information processing, computational harmonic analysis, imaging and image processing. A Shanghai native, Lu received his undergraduate degree at Shanghai Jiao Tong University before moving onto the University of Illinois at Urbana-Champaign, where he received his M.Sc. degree in mathematics and his Ph.D. degree in electrical engineering, both in 2007. After his postdoctoral work done at the École Polytechnique Fédérale de Lausanne (EPFL) in Switzerland, Lu joined Harvard SEAS at the end of 2010. Among his many honors, Lu received the Most Innovative Paper Award of IEEE International Conference on Image Processing (ICIP) in 2006; the Best Student Paper Award of IEEE ICIP in 2007; and the Best Student Presentation Award at the 31st SIAM SEAS Conference in 2007. He is a recipient of the 2015 ECE Illinois Young Alumni Achievement Award. Lu has taught a number of electrical engineering and applied math courses at SEAS, including ES 150: Introduction to Probability with Engineering Applications; ES 255: Statistical Inference with Engineering Applications; and ES 254/AM 254: Information Processing and Statistical Physics.